Laid into drop spine case: One folded sheet (20 x 20 cm.) which unfolds into a paper structure with various panels containing text printed in red and black, including instructions for use of the work. 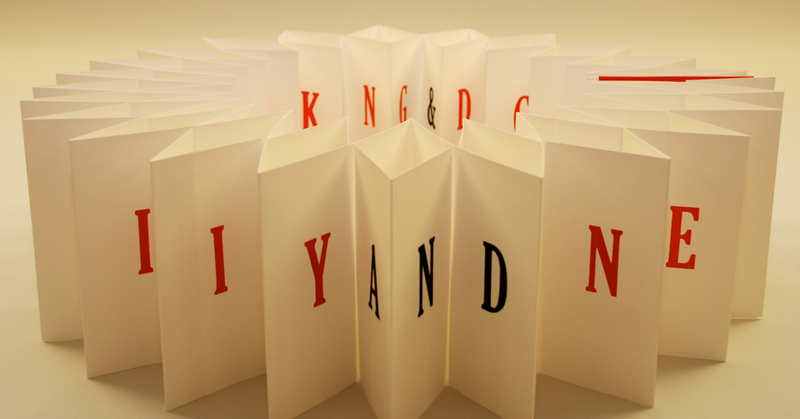 “The structure used in this book is a combination of two accordion folds. Both are first creased, then each segment is cut halfway through at the center and finally the two strips are merged together where the cuts have been made.” Limited edition of 60 copies. “The book is one of the most powerful weapons ever invented.” — Werner Pfeiffer, Book-Objects & Artist Books, online exhibition, Cornell University Library’s Division of Rare and Manuscript Collections. “The book, the idea of a book or the image of a book, is a symbol of learning, of transmitting knowledge … I make my own books to find my way through the old stories.” — Anselm Kiefer, publication entry for Brünhilde schläft, in Toledo Museum of Art Masterworks (Toledo, 2009). Like Anselm Kiefer, though eight years older, Werner Pfeiffer grew up in the shadow of Nazi Germany. The works of both artists are rooted in the book and its peculiar place in that culture. Pfeiffer’s book-objects consist of deconstructed, dismantled library discards that are reassembled with glue and coated in gesso. “Gagged and tormented” (with nails, screws, rope and various physical distortions), the works are “symbols of pain, of torture, of suppression which are inevitably brought on by the censor’s act”, the real remnants of which Pfeiffer recalls from his earliest childhood. Pfeiffer’s artist books on the other hand run the gamut of foldouts, scrolls, flexagons, walk-in environments and rely on traditional bookmaking craft: handset type, letterpress printing, sophisticated binding as well as original print techniques such as wood cuts or linoleum blocks and etchings on archival papers. The emotional range of Pfeiffer’s art is also wide — humorous, playful, piquant, simultaneously angry and sorrowful, concerned. The overriding concerns are straightforwardly explained in the text to the online Cornell University exhibition. The first schoolbooks I can remember, leftovers from the previous regime, were heavily “edited.” They were books with words and sentences blackened out. Chapters were deleted; entire pages were missing. This was information declared unsuitable for a post-war generation, a generation who six months earlier had been practically obliterated by the events now deemed unfit to be read about. Part of what they had lived through, their own history, had been blocked out, hidden behind those black marks. Measured by the perceived fears an innocently bound codex seems capable of instilling, the book is one of the most powerful weapons ever invented. And yet we find ourselves at a threshold where its power and influence seem to be waning. … As in the past, we find at the core of our current socio-political realignment the process of communication…. The new cultural footprint is a set of digits and their application, made possible by the microchip and the speed of electricity…. My book-objects have their origin partly in this ambiguous realm, a period of change as radical as it is dramatic. Superimposed over this perceived uncertainty is my personal concern about censorship. By making books which are deliberately mute I try to raise questions. Words are lost; they are no longer important. The books take on new forms; they become provocative statements. No longer instruments for reading they become sculptures, they become Book-Objects. As with all superior sculpture, Pfeiffer’s works make the hands twitch to touch and manipulate them. In a few exhibitions, that interaction has even been encouraged. There is something inherently haptic about his book art (for example, Zig Zag and Abracadabra) and his book-objects (for example, Drawing Blood), which can be enjoyed vicariously in these videos: Youtube 1, Youtube 2, Youtube 3 and Youtube 4. Kiefer’s materials are more varied, more monumental than Pfeiffer’s, and his concerns are decidedly not straightforward. Considering his sprawling studio complex at Barjac, in southeastern France, and its towers and installations, to say that Kiefer’s oeuvre extends beyond book art is an understatement. But for Books on Books, his most moving works — even those in which the book’s material presence is greatly subordinate — remain tethered to book art. 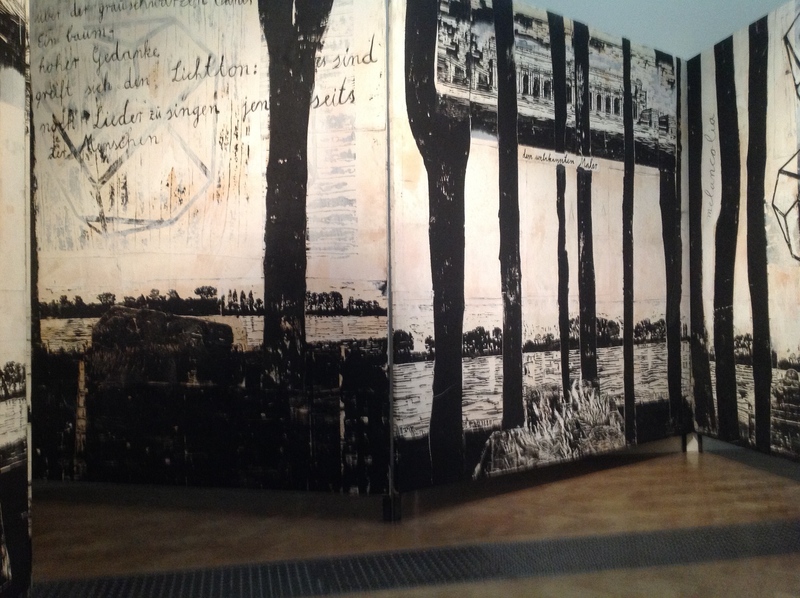 The ache to touch Kiefer’s art, however, is different from what you feel with Pfeiffer’s. What little playfulness there may be in some of Kiefer’s earliest pieces is overshadowed by monumental works evoking an urge and dread at the same time. You feel it walking up the stairs in the Royal Academy, looking up and seeing the sculpture Für Fulcanelli – die Sprache der Vögel, its great wings of beaten lead spread and rising above you. Between the wings, the body is made of a stack of elephant and double elephant folio books lying flat (or rather gathered folios made of lead like the wings). Interleaved with the closed and open books are rusted metal folding chairs with wooden seats and backs, the kind found in city parks. Thick metal wedges that appear to be wood are inserted at various points to balance out the angular, tilting pile. Separate and lying before this huge bird is a carved wooden snake, elongated and heading right to left as you view the work. The pages of the books curl and fold and roll up as if sodden or aflame. Some are rusted. The bottom-most book has lead binder boards, water stained and looking like marbled paper. Not all of them have binding boards, but all are spineless. You want to touch but know that if you do, your fingers will come away with some alchemical residue of history that will not come off and may burn the skin. Pfeiffer’s works from a major exhibition in 2011 at Cornell remain on view online. Another major exhibition followed in 2012 at Vassar College. A new exhibition is scheduled for February 2015 in Toledo, Ohio. More about it in The Blade. A major retrospective of Kiefer’s art at the Royal Academy of Art concluded in December 2014, coinciding with an hour-long BBC program. An interview with the artist and several podcasts are available on the RA’s site, and the rich and extensive exhibition catalogue provides articles exploring the complex themes of Kiefer’s art.